Gambling online in the US is fun; just turn on the PC or Mac, log in to your favorite casino sites and play some real-money roulette or blackjack. Playing for fun is OK for a while, but how can you take the next step and ensure more regular wins and a healthier bankroll overall? Here, we list some of the best tips straight from our team of USA gaming experts. And when you have digested these tips, put your new knowledge into practise and sign up to a great casino or gambling site today using one of our top links. How many times have you felt like playing a few hands of blackjack or poker, or a few spins of roulette, and loaded up an Internet site to enjoy some top gambling? If you just play on the net for a few minutes at a time you can lose track of what you're betting. That is why employing sensible bankroll management is key. Before you play poker, slot machines or casino games at a United States gambling site, set aside a bankroll JUST for gambling with. Better, open a separate bank account with a debit card you only use for gambling. That way, you know exactly what is going in and out of your bankroll. Next, pick your stakes. For example, if you have a $100 bankroll and are playing poker tournaments online, consider sticking to $5 tourneys (5% of your roll) or less. That way you can handle the swings. Similarly, if you are playing slots or roulette, keep a sizeable chunk of your bankroll behind in case of a bad run. Sensible bankroll management is the most important thing you can employ if you are going to be a successful gambler online. In the USA in 2019, it can be pretty hard to get your cash in and out of a top gaming site, even if you live in one of the newly regulated states like Nevada or New Jersey. UIGEA made it hard for banks and credit card companies to process transactions, and that situation hasn't changed much since 2006. Therefore, it's important you do your homework and find a banking option that lets you get the funds you need into your gambling account quickly and with minimal fees. Have a look through our banking pages on this site for a better idea of the charges and min/max deposit limits open to you. It's essential to know the odds of hitting the various bets on offer, whatever the game you are playing. For example, if you're new to USA roulette online, it can be tempting to put $50 on 32 Red and cross your fingers hoping for that lovely cash to roll in. Hitting a single number in roulette pays out 35/1, but it's 35/1 for a reason. Why? Because it doesn't hit very often. More sensible options for long-term profits are the even-money, outside bets like Red/Black or Odd/Even. Similarly, knowing when to stand in blackjack and understanding the odds of hitting the card you need, even at a basic level, will put you in a good position to profit at blackjack. Whatever betting game you are into, get a basic grasp of the odds and you will have a healthier gaming life. There are so many casinos on the web it can be difficult to sort the suckers from the superstars. That's why even a cursory look at the site's homepage will show you if the casino can be trusted. Look for awards and certificates of independent auditing from firms like eCOGRA who ensure the Random Number Generators are regularly checked and fair. 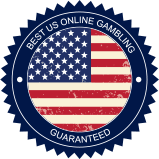 It's also essential to find a properly licensed website in a recognized gambling jurisdiction. Not all jurisdictions work in the same way, so it pays to do a little background checking first. The beauty of online gambling is that it introduces US players to games they may never have tried in a land-based casino before. Be it 7-card Stud, craps or progressive slots, Internet gaming sites offer so much choice it's tempting to try something new out. Most rooms in 2019 will let you try out games for free first (a kind of 'try before you buy') so this can be the perfect opportunity to see if you like a certain roulette variation or that brand new 3D slot that's just been released. Play money games are also good for trying out betting systems. Not all systems work, but testing them out with virtual cash is hard to beat. There is so much competition out there on the web (even for American players) that United States sites are fighting for your custom. To entice you in, gaming websites offer up welcome promos for first real-money deposits. These can run into hundreds of dollars as long as you make an equal initial deposit and play through enough qualifying games in the required timeframe. Bonuses can vary from site to site, so check our pages for the best on offer to US players in 2019. And never commit to a bonus if you don't think you can put in the hours. Many gamblers understand the odds of the bets they are making, but fewer grasp the house edge, the advantage that the casino holds over the players. Betting on 31 black in roulette pays out 35/1, but there are 38 slots on an American Roulette wheel. What happened to the rest of the payout? That discrepancy is the house edge, and knowing which games offer the kindest house edge to players is important when gambling. Check out our top guides to the most popular games to discover which ones are guaranteed to have you running uphill when taking on the casinos. Betting systems have been around as long as betting itself, but are they worth the effort? Betting systems like the Martingale can be employed across many games. Essentially it requires you to double your bet if you lose, and keep doubling until you win. This then covers your losses and you start again with a minimum bet. If you're a roulette player in particular, there are many systems you can try but most, like the Martingale, require a huge bankroll and plenty of time. Unfortunately for most USA gamblers, they have neither. Read up on some of the various betting systems out there and try one or two out with play money first. If you like them use a little real cash to see how you fare. This site provides a good breakdown of the popular 'doubling' betting strategy. Internet gambling is quick and convenient and lets you play games you may never have tried before. But there's a big, wide world out there, folks, and there are some fantastic USA brick 'n mortar casinos to visit. OK, they may be far away, especially if you live in a state that doesn't have any live casinos, but they are so great to visit. There, you can try out some of the slots, poker or roulette games you have been enjoying online and experience the added thrill of being around other gamblers, hearing the sounds, grabbing some free drinks, and even watching a show. Online gambling has a lot going for it, but betting live in the United States adds plenty more too. Sensible gambling isn't just about a good grasp of the odds and finding out who offers the best welcome bonuses; it's also about handling yourself properly at the virtual games. Drinking and gambling is a sure-fire recipe for disaster. Alcohol affects your judgement and gives you a sense of invincibility. "What if I just put a bet on that rank outsider, the longest odds? It could happen, it could happen..." Then, before you know it, you're down a hundred bucks and staring at a session chasing your losses. Be sensible: stay sober, concentrate on what you're doing, and quit when you're ahead. At the end of the night you will find your bankroll that little bit healthier.